This magnificent and large antique George III sterling silver salver has a plain oval form onto four bracket style feet. The surface of the salver is embellished with an impressive engraved marital coat of arms* surmounted with a helm and accented with impressive scrolling leaf ornamentation to the background. This contemporary coat of arms is surmounted with a crest of a plume of six ostrich feathers charged with a catherine wheel and bears the bannered motto 'Virtute' - By Virtue to the lower portion. 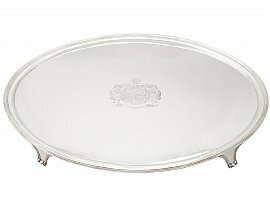 The rim of the salver is embellished with an applied reed decorated border. The Georgian salver is supported by four bracket style feet, ornamented with scroll and ball ornamentation in addition to a reed decorated border. This exceptional antique sterling silver salver is a fine example of its type. * The marital coat of arms is that of the Reverend William Thomas Parr Brymer and Jane Ann Wilkinson. Rev Brymer was born in Halifax, Nova Scotia. He studied at Trinity College, Cambridge, becoming Canon of Wells in 1834, and Archdeacon of Bath in 1839. Jane Wilkinson was born in Burchester, County Durham. Read this items heraldic identification report. There are fire marks to the surface and some minor surface scratches, in keeping with age.